I ordered this seat for my 5 month old after reading several articles and blogs from Pediatric Occupational/Physical therapists about developmental issues that can arise from elevated seats (bumbo) where babies legs are not flat on the ground and their trunks are not supported. Even though itâs not recommended by the manufacturer, it definitely feels secure enough to be on top of a table so he can see me when Iâm cooking/cleaning in the kitchen or when we are eating. It has a wide base and doesnât move even with a squirmy baby. That may change once he gets a bit more mobile, but for now, it works great. We also use it as a high chair and feed him in it. It does get messy since the sides of the seat come up pretty high, but the cover snaps off and washes easily, so itâs not a big deal. I like that it folds for more compact storage but I donât love that it doesnât fold completely flat. Also, once you assemble it, you wonât be able to take it apart, so that is another thing to consider if you are planning on traveling with it. My daughter is 11 weeks old and LOVES this seat! 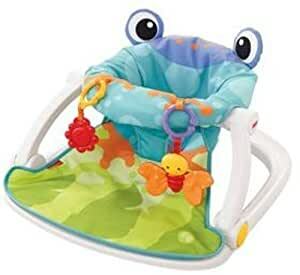 It is perfect for babies wanting to sit up but aren’t quite able to sit in a bumbo or jump saucer. It provides great head and neck support. She looks around and just smiles while she’s in her froggy seat! It is a must have in my opinion! I’m so glad I found it. This chair was great for about 2 weeks while my baby was 3 months old. By the time she reached 4 months she was too active and became fussy and claustrophobic in this seat. It is great for babies who want to be upright but do not have the core strength to sit on their own. I have a love hate relationship with this chair ajd I am not sure why it has so many great reviews. It is good for allowing baby to sit up safely with no problem. It is a fabric seat over a wide plastic bar back which I doubt is the most comfortable for a baby in the beginning stages of sitting up. A larger baby who already sits on its own should have no issue. The fabric seat is easy to remove and wash for the occasional blowout. My issue is getting baby out. I never felt comfortable removing LO from this seat and I had a small infant. I may have used this seat a total of 10 times between 4 months and six months of age. I say find something else to park baby in for a few minutes of play time. My 3 month old thinks she is older and tries to sit herself up. This thing is an absolute life saver! We love it and she loves it! You have to get one!! We move all over the hose with her in that thing. Makes getting chores done a lot easier! He could only sit in it for around month or so because it became cumbersome AND he outgrew it. His legs were hanging from the seat about an inch but his calves and feet touched. To me that position would be uncomfortable and apparently it was for my son as well. I bought the Bumbo and my son like that so much better then this. This product is just what I expected and I am very happy with it. It was super easy to assemble. There were 5 plastic pieces if I remember right and you just snap them together. My 4 year old had an easy time helping. The fabric is all one piece and has little button holes that you secure around notches in the plastic part of the seat. It feels sturdy enough for the baby. The fabric is a nice durable quality too. It will also be easy to take the fabric off to wash it. Right now my baby is about two and a half months old and just over 12lbs. She likes to sit up and look around, but can’t hold herself up yet. She does have good neck/head control. She doesn’t sit well in a bumbo seat, but this seat hold a her up really nicely. This is exactly what we were looking for. I included a photo. You can see she looks supported in the seat and she fits in it easily right now. However you do want to keep in mind that this is the type of baby item that they will outgrow rather quickly. I would recommend this product. It may only last for a few months, but will be so helpful in that time!